Getting the wedding and engagement rings right. I started using my proposal ring process to allow designs that cannot be resized to be used for a surprise proposal without fear of getting the finger size wrong. This ring shows a great use of the process even when the ring is resizable. Article: The wrong finger size....no surprise! I made this proposal ring back in 2017. At the time we resized it so that the recipient could wear the ring whilst it was remade to the correct finger size. Before I remake any proposal ring to the correct finger size we always explore the desired wedding ring. 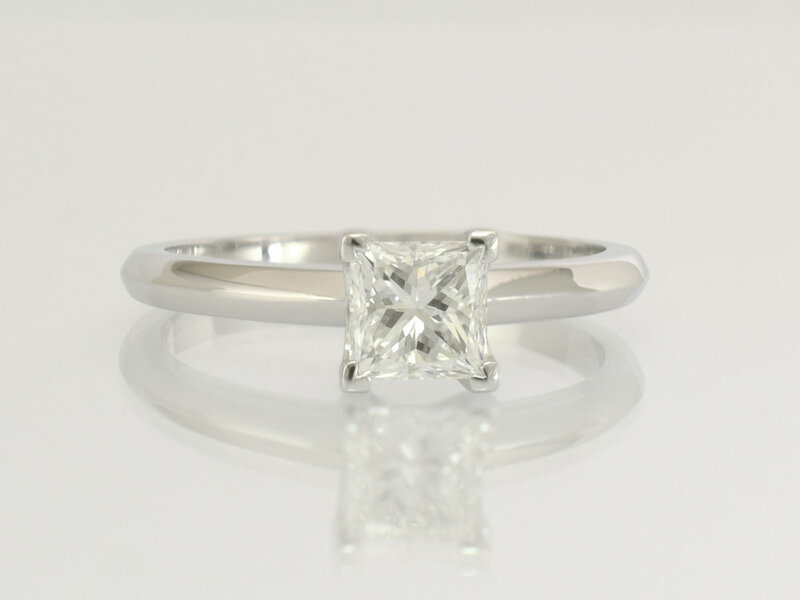 Whilst remaking the proposal ring to the correct finger size I can also make any required changes so that it suits the desired wedding ring perfectly. This customer decided to wear the resized ring and think about the wedding ring in her own time and use the free remake later. Fast forward to 2019 and she was ready to design her wedding ring. The desired design, a starting point. She liked this ring she saw somewhere else but it was just not quite right. She had seen a style of ring that she wanted to use as her wedding ring. She planned to have diamonds all the way across the top of the ring and down the sides a little. She felt the band on her engagement ring did not look right next to the wedding ring she tried on elsewhere. She wondered if making her engagement ring band wider would solve the issue. The desired increase in width on the left with the original on the right. With the band widened to what she thought she liked we could now see how it would look next to the wedding ring by digitally editing images. With the diamonds going so far across their flat top clashed with the knife edge band. She did not like the look of tapering the knife edge at the diamond to a flat at the sides. Totally flat band she liked even less. We looked at the ring wider, tapering to flat or totally flat and nothing really worked. She wanted to retain the knife edge band on her engagement ring so she was stuck. Less diamonds allowed for a bit of the wedding ring knife edge band to be visible. To solve this I suggested to her that sometimes less is more. If we reduced the number of diamonds to 9 in the wedding ring the knife edge band would be visible at the sides. 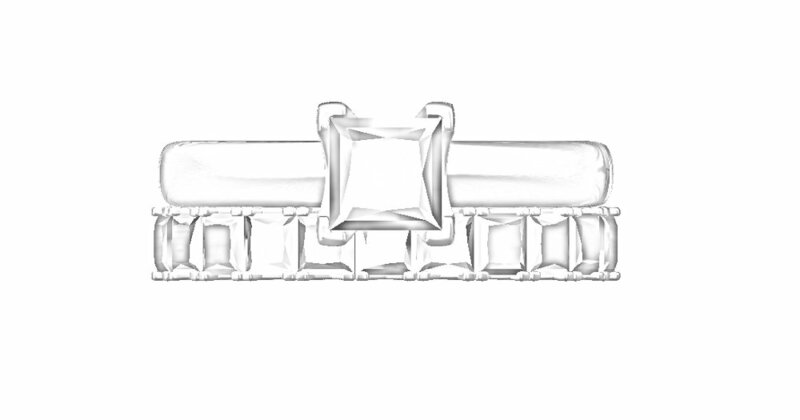 This would soften the flat top of the diamonds and blend it into the band of the engagement ring. When she saw the photo above she was happy. Just enough of the band visible to connect the two rings. 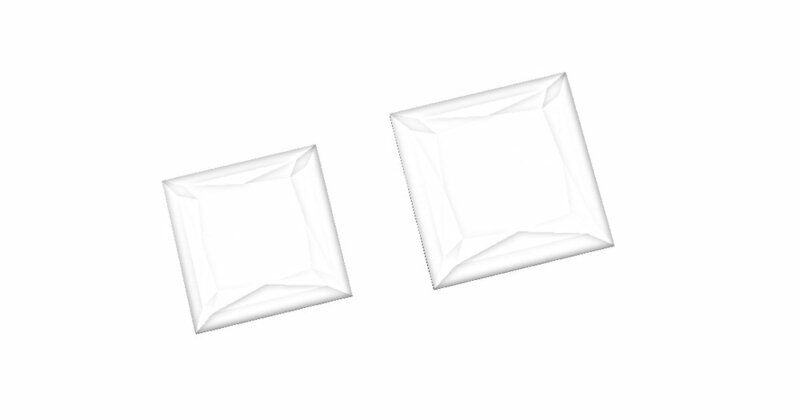 3mm and 3.5mm square cut gems top view. Above is a 3mm square cut on the left and a 3.5mm on the right. Often people are very surprised how much a small increase in width can make to appearance from the top. It also increases the gem depth as well. Gem depth is often a cause of quite a few issues when I am asked to remodel old pieces of jewellery into a design the customer has in mind. I digress, back to these rings. The depth increase in the gems is quite large. As gemstones get wider they get deeper and the ring that they are set into needs to be at least the same depth. A ring can only be as low as the gems that go into it and in most cases they need to be a little deeper. With the wedding ring band needing to be thicker the engagement ring band needed to be thicker to match. 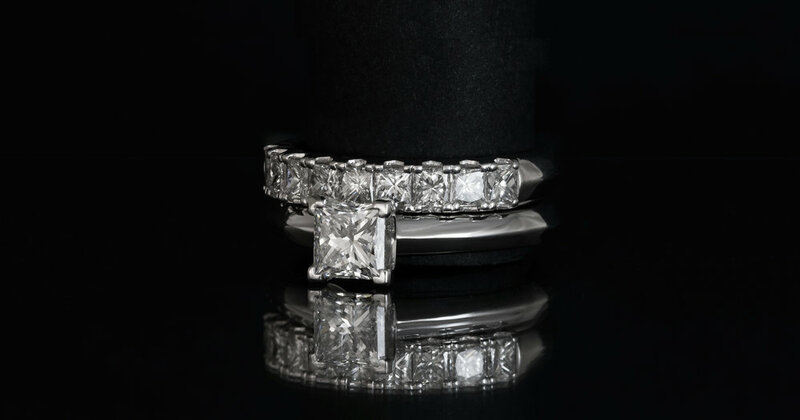 This happens often when customers want larger diamonds in their wedding rings. I already make my rings thicker than most and In the photo above the original engagement ring is on the left and the increase in thickness required shown on the right. 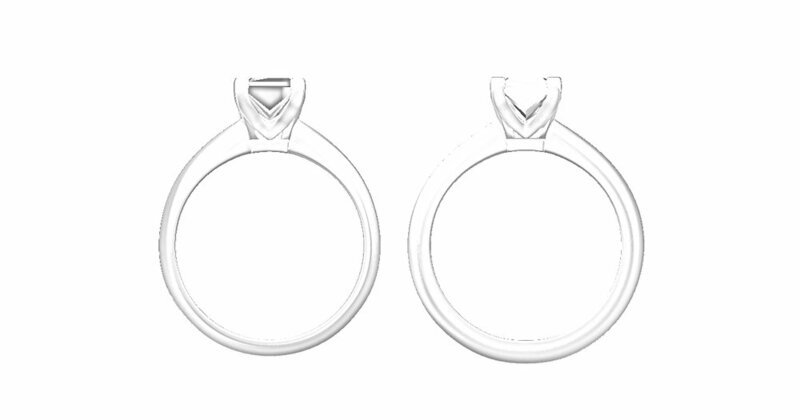 Rough drafts of the wedding ring and altered engagement ring. I created drafts of the wedding and modified engagement rings so that the customer could confirm that what we had digitally created she would like in metal on her hand. I do not usually set all the diamonds into a draft but in this case I did as I wanted to make sure they were not too big and give the customer the option to reduce the size if she wanted. I forgot however to take a photo of the draft ring with the diamonds in it sorry. The main reason is because this is what most people come to me are looking for and expect. They want their rings to be made properly and understand that takes time and effort. With every proposal ring I make the remake to the correct finger size in the same design is included in my price. It is very important to me that the new engagement ring my customers wear is not a resized ring. This is a new chapter in their life started with a new ring, not one that has been repaired/resized to expedite a sale using a process that is not good for a ring and in some cases can destroy it. Article: What to expect when you buy your engagement ring from a jewellery chain. Not good! Only if major changes are made to the design is there any charge and we never do anything until the customer has discussed and accepted a quote for their desired changes. In this case the widening of the band did increase the gold weight of the ring quite a bit. As a thank you to this customer for her loyalty the changes and the remake were free of charge.